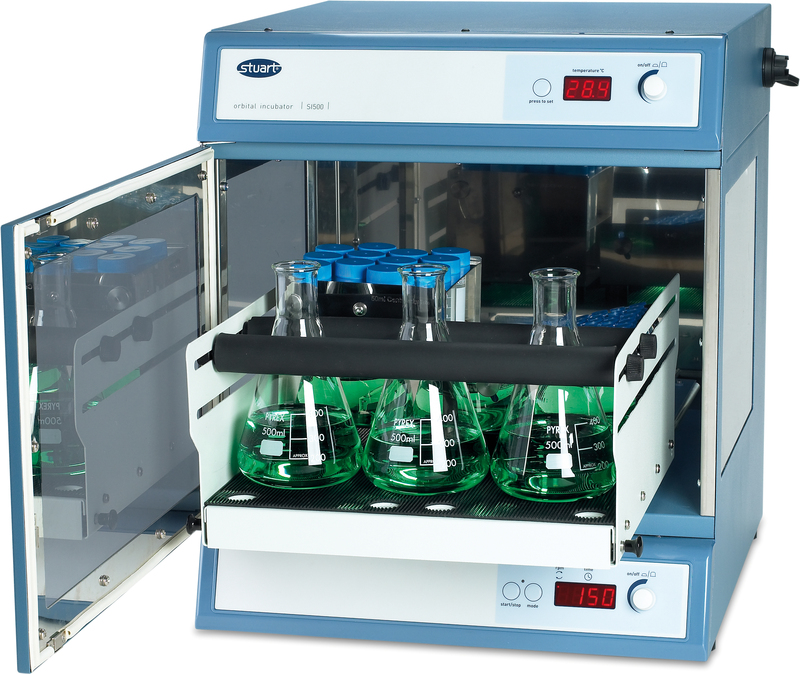 The new Stuart SI500 combined shaker and incubator provides an orbital shaking motion, adjustable between 30 to 300rpm with a gentle start action. Shaking speed is microprocessor controlled and set via a digital LED control panel. The incubator incorporates a versatile digital timer which can be set from one second to nine days. After the timer has counted down the shaking action stops and an alert sounds; as a safety feature however the incubator continues to run. The incubator temperature is set via a separate bright LED display while encoder control ensures that the temperature can be quickly set between ambient temperature +5 degrees and 60 degrees. Forced air circulation ensures uniform heating of the load. 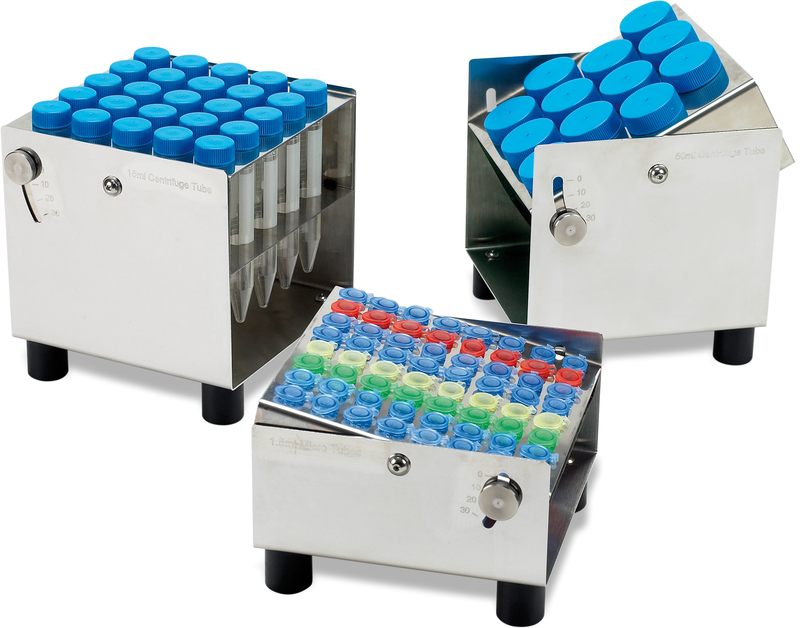 The platform has a versatile clamping system which secures most sizes and mixtures of flask up to 1 litre capacity. 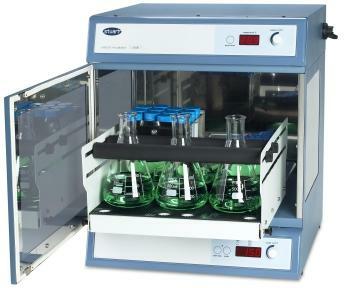 Typically, the platform will accommodate the following Erlenmeyer flasks: 12 x 250 ml, 9 x 500 ml or 6 x 1000 ml. The unit features a retractable platform. Under normal use the platform is locked in place but it can be drawn forward out of the chamber to allow easy access to samples at the back of the incubator. 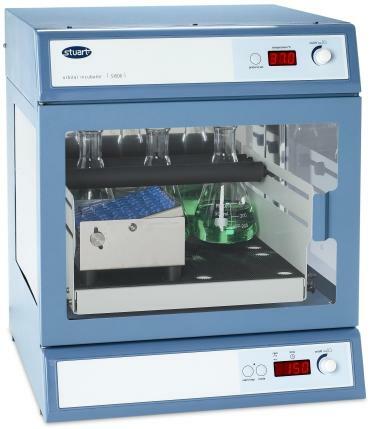 Smoked acrylic windows in the incubator door and on both sides allows maximum visibility of samples. The SI500 also features a USB connection and dedicated software to enable long term temperature monitoring - for example over weekends.